So you think there’s no hometown soccer at Marina Auto Stadium this summer? Think again. The Rochester Lady Lancers and Lancers will be taking over the pitch along Oak and Broad streets starting with a Memorial Day weekend Sunday afternoon doubleheader. The Lady Lancers, off to a 1-0-1 start in United Women’s Soccer (UWS), play the Connecticut Fusion at 2 p.m., followed by the 5 p.m. match between the Lancers (0-1 in the National Premier Soccer League) and Erie FC. Both Lancers teams played at Aquinas Institute last summer, but the school is installing new turf so they’ll play downtown. Doug Miller never played an official match at the downtown venue, but it’s safe to say the former Rhinos scoring star had more to do with the it’s rise from the dust than anyone. Miller, coach of the Lancers, helped turn the Rhinos into a summertime hit in Rochester in the late 1990s and into the 2000s. He scored the first goal at Frontier Field in 1996, and the last goal in the final game at Frontier Field in 2005. His players will now get a taste of playing in pro-league venue. 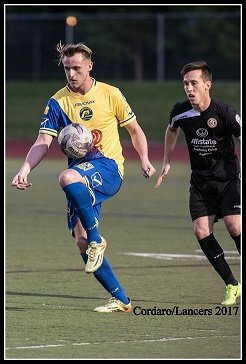 The NPSL helps develop amateur players, and the Lancers certainly have players with pro aspirations. “For a lot of our guys who are looking to play at that platform, it generates a lot of excitement,” Miller said. The Lady Lancers didn’t win a game in 2017. They haven’t lost one in 2018. They posted a high-quality 2-2 draw against the perennially powerful New England Mutiny on May 19, gaining the tie in a 90th minute goal from midfielder Elin Eklund. “It was nice to see the fight that we had,” Galvano said. The next day they routed the Worcester Smiles 9-3. Eklund and forward Brooke Barbuto each scored three times. Eklund, a native of Sweden, is a former player for Galvano at Monroe Community College. Barbuto, a Syracuse native, played four years at NCAA Division I Stony Brook before embarking on a professional career that took her to Iceland, Finland and Australia. Goal No. 1 in the off-season was to acquire goal-scoring, since the Lady Lancers produced just nine goals in 10 games last year. It appears to be mission accomplished. Not much has changed on the Lancers roster, with forwards Will Stone (six goals, one assist) and Issac Kissi, defenders Rafael Godoi and Jake Schindler, and goalkeeper William Banahene are among the returnees from last year’s team that went 6-4-2. They missed the playoffs by one point. Salvatore “Soccer Sam” Fantauzzo oversees operations of both Lancers teams. He, too, once called Marina Auto Stadium home when he ran day-to-day operations for the Rhinos. “We were drawing 7,000 a game, we finally had the stadium buzzing,” he said. Health issues forced him to step away, and then Rhinos management hired a replacement. He’s now back with his own teams for Year 2. “Last year was a huge success; I think we outdrew the Rhinos most games,” he said. Season tickets for both teams are just $55. That’s for six Lancers games and five Lady Lancers games (all part of doubleheaders with the men’s team). Individual game tickets are $10, and kids under 5 are free. Austin Giorgio, who captivated NBC TV audiences with his run on The Voice, will sing the anthem before both games on Sunday. The Webster native and SUNY Geneseo senior will also sign autographs.